In a bowl, mix yeast and 1 tsp sugar. Add warm water and keep it covered for about 10 minutes or till frothy. Then add yoghurt and oil and mix well. In a large bowl, add all purpose flour, 1 tsp sugar, baking powder and salt and mix well. Add the yeast mixture (step 1) into the dry flour mixture (step 2) and mix well using spoon. Then knead well into dough using your hand. The dough will be sticky and very soft, do not add any extra flour into it. Cover with a damp cloth and keep it on warm place for 3-4 hours or until the dough doubles in size. Punch the dough down and divide it into 6 equal portions. 7. Now prepare a bowl of water and a bowl of dry flour before making naan. 8. Heat a tawa or cast iron skillet on high heat. 9. Dust your rolling board with some flour and roll out each ball into oval shape about 8 inches long. 10. Now apply some water on surface of rolled naan and place the watered surface down on heated skillet. 11. When it starts to bubble, sprinkle some water on that side and let it cook for 1 minute. 12. 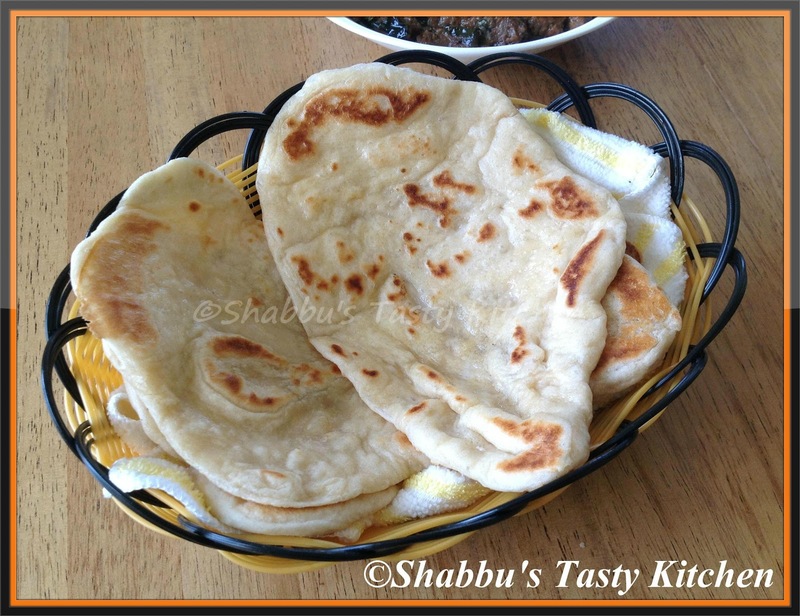 Then flip the naan over and cover immediately with a lid and cook for 40-50 seconds or until brown spots appear. 13. Remove from the pan and brush lightly with melted butter and serve hot with any curries.. This perfect naan is my favorite too.. Perfectly made naan, nicely presented. This is easy nann recipe love it.